Al Jazeera's Marga Ortigas speaking from the Philippines capital Manila says communication has been and still is impossible. "The problem has been how to get communication lines back up. They need to understand what is needed and where. The government says the typhoon has affected more than 4 million people. Most of the areas are still in the dark, many islands not able to communicate with those outside. They think it will take some days to reach those affected. All in all, most of those islands are still without contact." According to AFP, one Philippine official says it's likely hundreds have been killed. 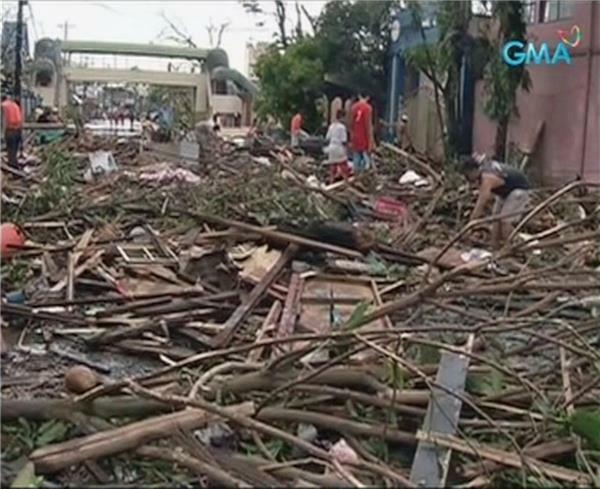 "I think hundreds," Energy Secretary Jericho Petilla said on ABS-CBN television when asked how many people had died in the coastal town of Palo and surrounding villages that he visited on devastated Leyte island. Are you in the Philippines? 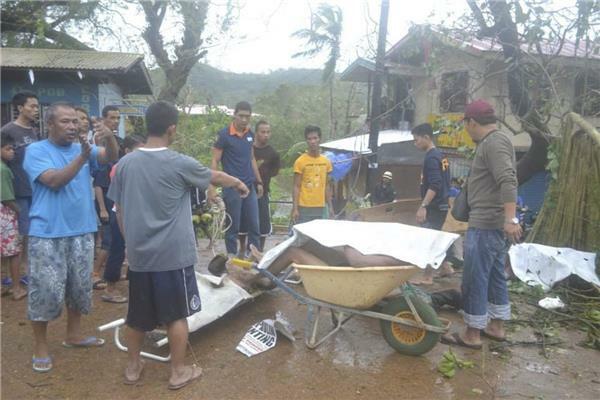 Have you been affected by Typhoon Haiyan? Al Jazeera's Jamela Alindogan said that the local government fears that the death toll could reach thousands, estimating possibly tens of thousands in Leyte province alone. "At 4:45am local time, we started feeling the wrath of the typoon, we moved to the second floor, from there I could see roofs being blown away. In ten minutes the water started going up really quickly, and we were trapped, we in the hotel with the other guests, all stuck and had no where to go, so we broke into a small stock room where the supplies were and we managed to get in. Me and my colleague climbed up to the roof near the ceiling ready to jump to the water and we managed to find empty barrels to hold so we could float if we wanted to jump. We were holding on to the ceiling and the whole roof blew away in an instant, and for the next two hours it was just like that. The noise, the sound was incredible, is hard to explain, it's like a beast just there, and you can't see but you can feel it and there is just debris flying everywhere, for two hours we were exposed. From there we made out way out, everything we had had been swept away, except the clothes on our backs. And we started to see a lot of dead people around, everything has been flattened, everything has been destroyed, it was a ghost town and it's incredible how just two hours of this massive typhoon destroyed this whole province. It's unknown what the rescue situation is, we're not seeing a rescue operation but we're just seeing a lot of helicopters overhead. There is looting, we need security as the situation becomes more desperate it becomes more precarious. The government is saying it tried to conduct forced evacuations of many coastal villages, as many people live by the coastline. The government is estimating at about 20, maybe 30,000 people must have been killed, and I think those stuck in the water will die as the rescuers cannot reach them any time soon." 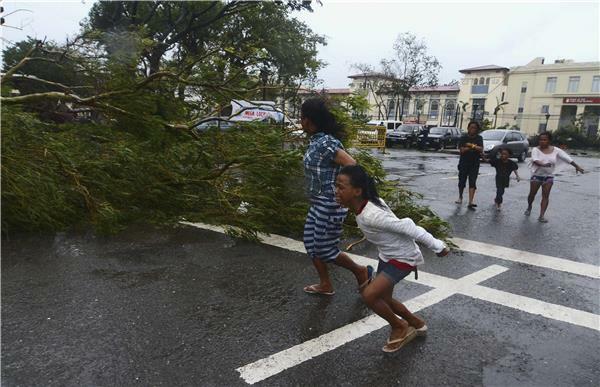 Vietnam has started evacuating over 100,000 people from the path of Haiyan, state media reports. 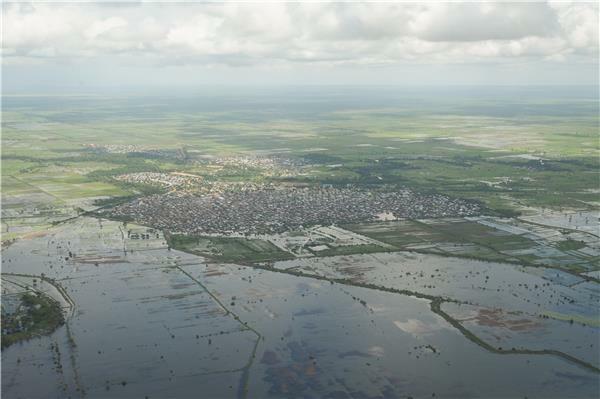 Mass evacuations are taking place in central Danang and Quang Ngai provinces, the Tuoi Tre newspaper said. Many schools have closed and people from vulnerable low-lying coastal villages are moving to temporary typhoon shelters set up in public buildings on high ground. 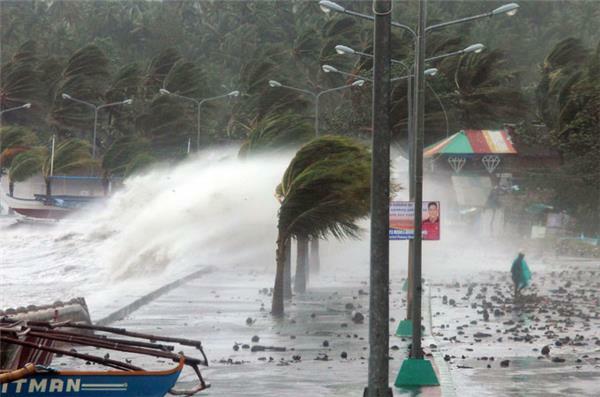 Although Haiyan is expected to weaken slightly, it is still considered a super typhoon with the potential for "complicated developments", said Prime Minister Nguyen Tan Dung at an urgent meeting on Friday. News are coming in from local media as communications are gradually being restored. Radio station DZBB is reporting that a storm surge at least 5 metres high hit Tacloban City in central Philippines at 8pm local time on Friday. At the city’s airport, which is next to the sea, there were two dead people spotted, according to the radio station. The typhoon is now over the South China Sea and has weakened to the equivalent of a category 4 hurricane. 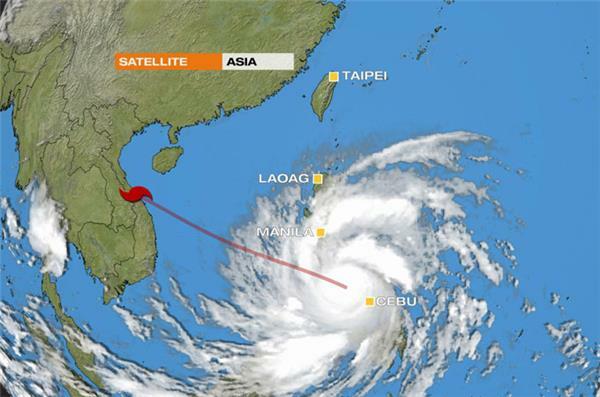 It is expected to weaken further as it heads towards Vietnam. The exact location of landfall in Vietnam is uncertain, with different weather models taking it on slightly different paths. Currently it looks like the storm will skirt up the eastern coast, affecting Hue and places to the north. New pictures from local TV show the extent of the damage. 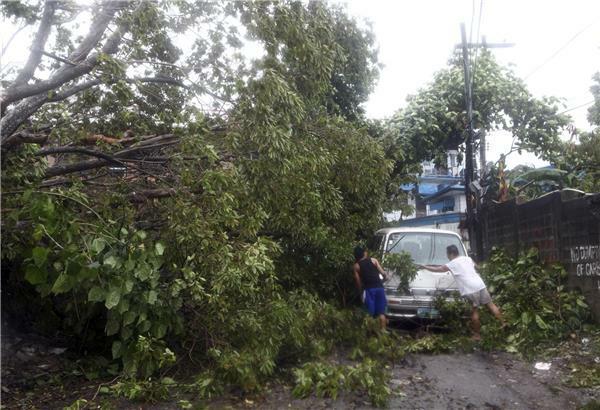 One of the strongest storms on record has killed more than 100 people and injured another 100 in the central Philippines before sweeping west toward Vietnam on Saturday, still packing destructive winds capable of blowing away houses and uprooting trees. Capt. 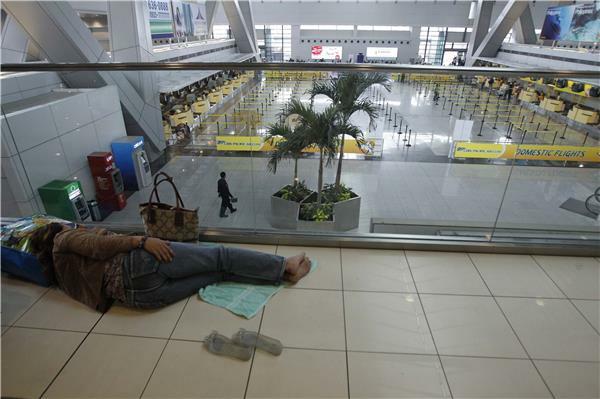 John Andrews, deputy director general of the Civil Aviation Authority of the Philippines, told The Associated Press that more than 100 bodies were lying in the streets and another 100 were injured in Tacloban city where the storm made landfall on Friday. 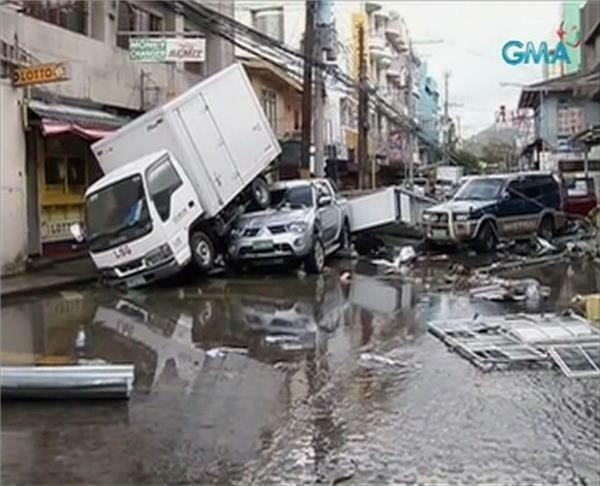 The Philippine television station GMA reported its news team saw 11 bodies, including that of a child, washed ashore Friday and 20 more bodies at a pier in Tacloban hours after the typhoon ripped through the coastal city. Residents attempt to reinforce their homes ahead of the storm [EPA]. 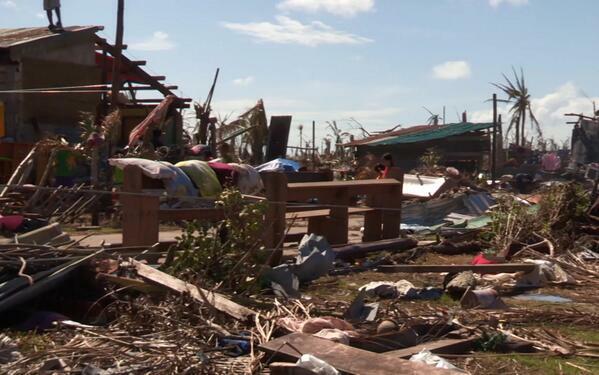 Homes like this would not withstand the winds of Haiyan which were over 300 kph. 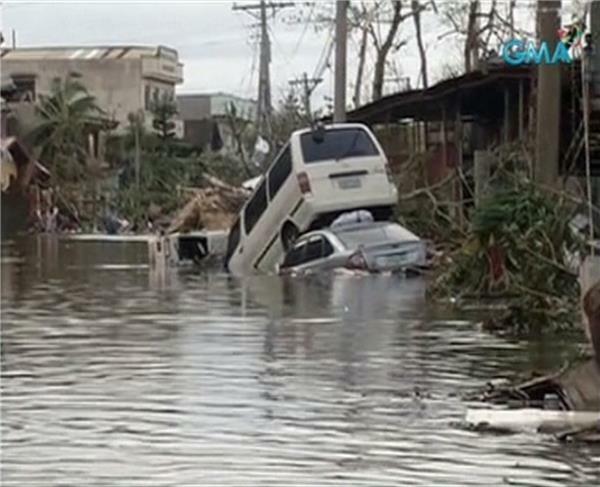 A resident of Capiz told Al Jazeera that the island province, also in central Philippines suffered major damage. muddy wasteland of debris on Saturday, with crumpled tin roofs and upturned cars. The airport tower's glass windows were shattered, and air force helicopters were busy flying in and out at the start of relief operations. 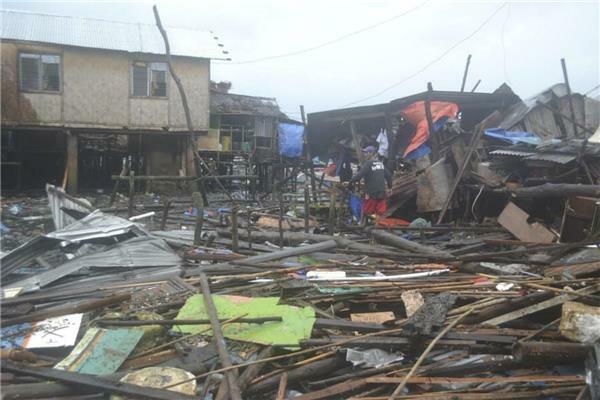 Defense Secretary Voltaire Gazmin said Aquino was “speechless'' when he told him of the devastation the typhoon had wrought in Tacloban. 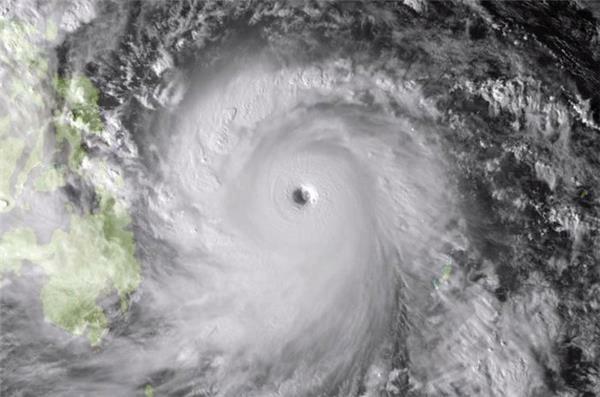 The following video shows footage of Super Typhoon Haiyan as it hit the central Philippine city of Tacloban. 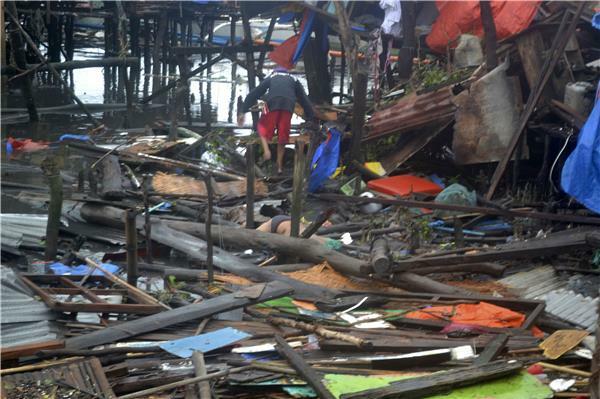 The following footage shows the aftermath after Typhoon Haiyan hit the central Philippine city of Tacloban. Another tropical storm in the same areas devastated by Typhoon Haiyan could impact and hamper recovery efforts, according to AccuWeather. The tropical disturbance heading from Papua New Guinea is expected to track through the Philippines in a trajectory similar to that of Haiyan. The storm itself is expected to strengthen into a tropical storm and hit with heavy rain by early Wednesday morning. The rain could trigger flash flooding problems leading to possible mudslides. While the winds are much weaker than typhoon strength winds, gusts could toss debris and cause additional hazards. The United Nations warned on Monday of a quickly mounting death toll from the super typhoon in the Philippines, with 10,000 people feared killed in the worst-hit city of Tacloban alone. One top humanitarian official said the UN was "expecting the worst" on the final body count, and also cited the desperate need for clean drinking water and food for survivors of the disaster. John Ging, UN humanitarian operations director, said 660,000 people had fled their homes because of Typhoon Haiyan and that the United Nations will appeal for significant international aid for victims on Tuesday. "The scale of devastation is massive and therefore it will require the mobilization of a massive response," Ging said, praising the Philippines government response to the disaster as "very impressive" so far. 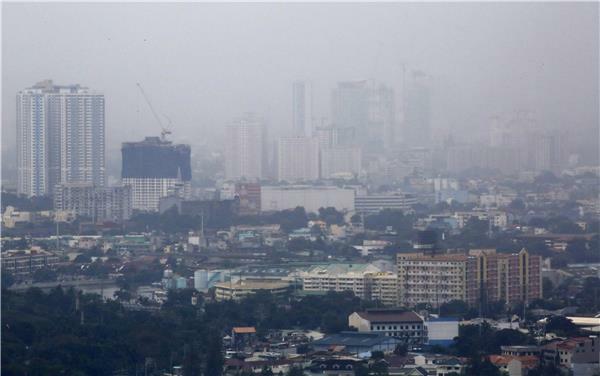 UN humanitarian chief Valerie Amos, who is heading for the Philippines, said in a statement that "local officials estimate that some 10,000 people were killed in one city alone". Her spokeswoman confirmed that she was referring to Tacloban, which was devastated by the storm. "Many places are strewn with dead bodies," Ging told a news conference at UN headquarters, confirming estimates that "over 10,000 people perished". Amos was expected in Manila to run a joint relief operation by private groups and the UN, which has already released $25 million from its emergency fund for aid. Tuesday's "flash appeal" for cash, was likely to be seeking hundreds of millions of dollars, UN officials said. The United States has sent an aircraft carrier to the Philippines to provide assistance in the wake of Typhoon Haiyan which leveled part of the country with more than 10,000 feared dead. The aircraft carrier, which carries 5,000 sailors and more than 80 aircraft, was in Hong Kong for a port visit and is expected to reach the Philippines in about two days. The US said Monday that it is fully committed to helping the Philippines recover from one of the most powerful typhoons on record, and is providing $20 million in immediate aid. 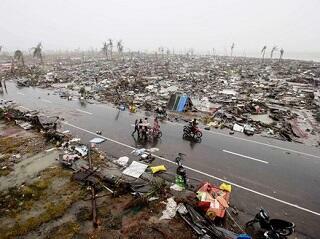 A view of devastation caused by Typhoon Haiyan in the Philippines. 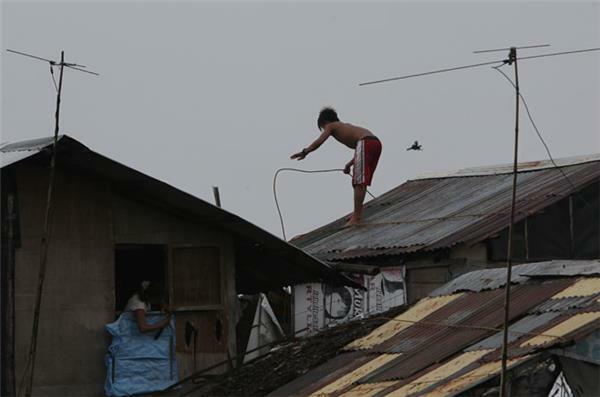 Aid is in short supply in the Philippines after Super Typhoon Haiyan. The United Nations will on Tuesday launch an urgent aid appeal expected to seek hundreds of millions of dollars to help the Philippines recover from the ravages of Typhoon Haiyan. UN humanitarian chief Valerie Amos was headed for the Philippines to lead a "flash appeal" for cash, officials said, saying the scale of devastation was so far-reaching that a major emergency effort is needed. The announcement came as the Pentagon said it had ordered an aircraft carrier, other ships and scores of aircraft that had been on a stop in Hong Kong to head to the stricken archipelago. 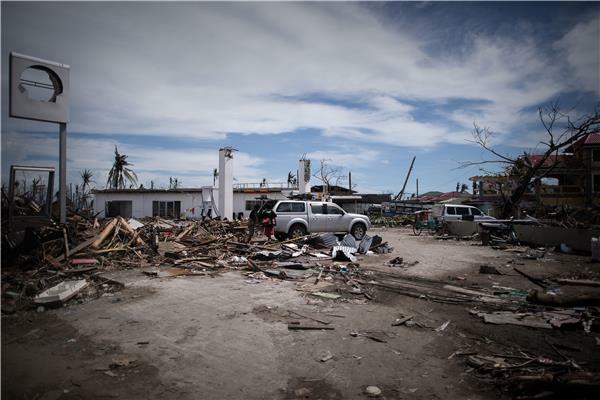 Ahead of the emergency appeal, UN Secretary General Ban Ki-moon welcomed the aid already pledged but said contributions "must expand urgently in the days ahead," given the sheer damage wrought by Haiyan. 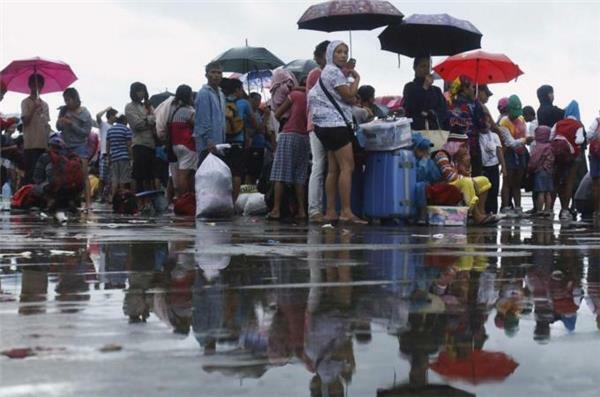 Britain is sending a ship and a transporter plane to assist with the relief effort following the typhoon, which may have killed more than 10,000 people in what is feared to be the worst natural disaster ever to hit the Philippines. "The scale of devastation is massive and therefore it will require the mobilisation of a massive response," John Ging, the UN's humanitarian operations director said, stressing the death toll was expected to rise. "Many places are strewn with dead bodies," Ging told a news conference at the UN headquarters in New York. The United Nation's World Food Programme published this video to raise donations for typhoon Haiyan survivors. 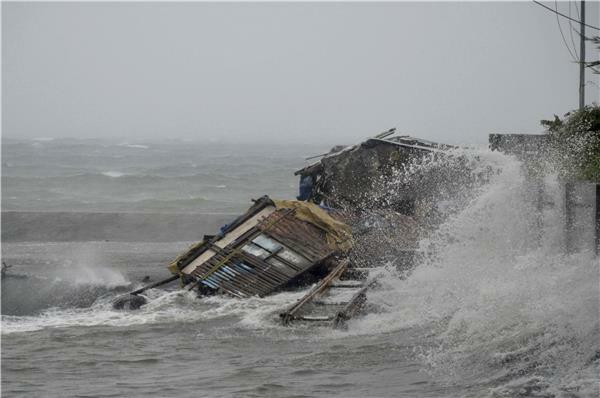 The death toll from the massive typhoon that hit the Philippines is likely closer to 2,000 or 2,500, not the previously reported figure of 10,000, President Benigno Aquino told CNN in an interview on Tuesday. "The figure right now I have is about 2,000, but this might still get higher," Aquino told CNN reporter Christiane Amanpour in an interview was posted on CNN's website. "Ten thousand, I think, is too much," he told CNN. "There was emotional drama involved with that particular estimate." Britain's Queen Elizabeth II on Tuesday sent her "heartfelt condolences" to the victims of Typhoon Haiyan, which swept through the Philippines over the weekend. 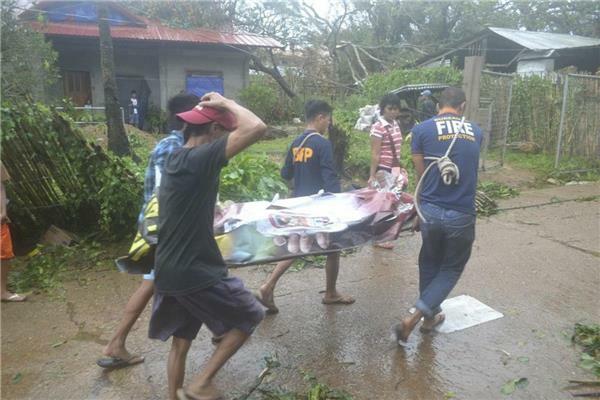 "I was deeply saddened to hear of the loss of life and devastation caused by the typhoon that hit the Philippines at the weekend," she said in a message sent to Philippine president Benigno Aquino III. "Prince Philip joins me in offering our heartfelt condolences to the victims and their families at this difficult time. "Our deepest sympathies go out to all those whose lives have been affected." A Buckingham Palace spokesman said the monarch would contribute to Britain's rescue appeal, which has raised £1.5 million ($2.4 million) in the 15 hours since it was launched on Tuesday. The television appeal was set up by the Disasters Emergency Committee (DEC), a group of 14 UK aid organisations including Action Aid, British Red Cross, Christian Aid, Islamic Relief, Oxfam and Save the Children. The government will match all donations up to £5 million, and on Monday announced it was sending a warship and transporter plane to help the relief operation. 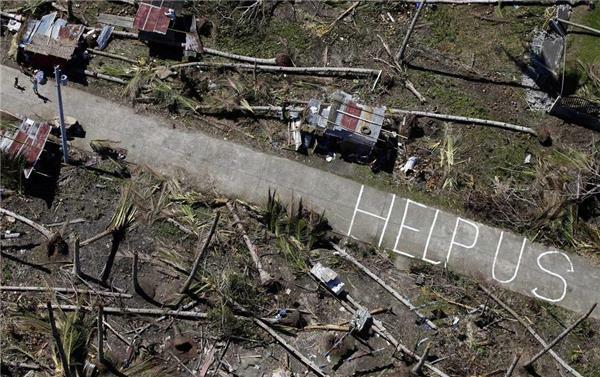 AT&T and Verizon are offering free calls and texts to the Philippines for customers trying to contact friends and family there in the wake of Typhoon Haiyan. AT&T wireless customers will be eligible for unlimited calls and texts until Nov 30. Landline and U-verse voice customers will get up to 60 minutes of direct-dial calling to the Philippines. The offer is retroactive to last Friday, when the typhoon hit the island nation, displacing more than 600,000 people. Verizon is waiving charges on residential landlines through Dec 7, also retroactive to Friday. Wireless customers who aren't under prepaid plans are also eligible. Sprint says it's still reviewing its service-relief offerings. Verizon, AT&T and T-Mobile say they are also letting people send texts to donate $10 to selected charities. The donations will be added to phone bills. The wireless carriers are waiving the usual text messaging charges and processing fees, so that the entire amount goes to the charities. Meanwhile, Apple is letting people donate to the American Red Cross through its iTunes online store. Apple says the entire amount will go to the charity. A Navy official says the US has decided to send two amphibious warships to the Philippines to help with disaster relief. The official says the USS Germantown and USS Ashland will get underway soon from Sasebo, Japan, where they are deployed. The official was not authorised to speak publicly about the matter, so requested anonymity. Pentagon press secretary George Little said the department is working to send whatever is needed to help the Philippines, which was devastated by Typhoon Haiyan. Officials are struggling to get food, water, shelter and medical equipment to the more than 11 million people estimated to be affected by the storm. The aircraft carrier USS George Washington, which is carrying helicopters and equipment to provide fresh water, is also heading to the Philippines. 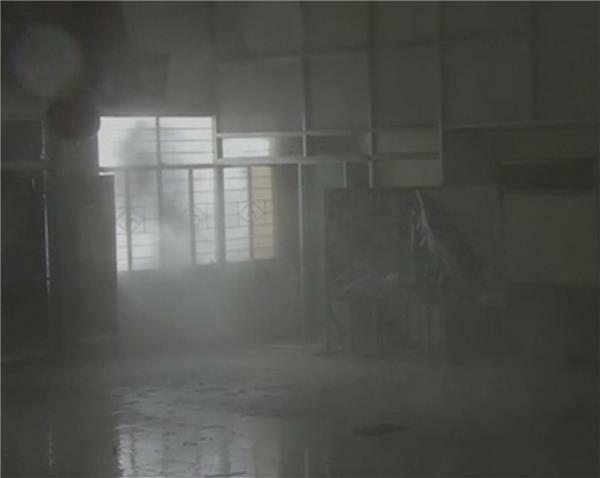 Philippines official says eight people are dead in looting of government warehouse in typhoon-ravaged Philippines town.